The amazing thing (for me) about this project is that I'm a self-taught musician and that the entire project had been done from scratch BY EAR, due to the original manuscripts for any of the episodic scores on the show being unavailable. In general, die-hard fans found many of the tracks were a lot easier to listen to and more coherent than the originals though it was a constant question from many fans -- "Was this the ORIGINAL music on your CD?" -- well, yes and no -- it was the original arrangements as closely as possible; same with the sounds, but many of the sounds on the show were just impossible to reproduce exactly -- BUT fans found many of the sounds were VERY close or better than the originals! Even Sylvester Levay, Udi Harpaz, Gene L. Gillette, John Kean or any of the other original sound engineers or session musicians on the show wouldn't be able to reproduce most of the sounds, feel and 'mix' nowadays anyway. I'd spent a long time on these aspects. I hit studio in mid-November 1998 and later April 1999 for post production and final pre-mastering -- of what was 22 episodic tracks on my CD, and 3 extended tracks conducted by Sylvester Levay with a FULL ORCHESTRA for his Special Bonus CD (just like the original 1st Season of the show). The other advantage with me doing the project (apart from being a huge fan of Levay' and Harpaz' work) is that being a graphic designer by profession I did all the artwork myself and am probably the only person in the world who owns high-resolution vector artwork of both the Airwolf logotype and Wolf Insignia as well as a full [Apple Mac only] Postscript font of the "proper" Airwolf typeface (unlike the inferior PC rip-offs available for free on the Internet) -- again all recreated to fanatical perfection. I even know Universal Studios don't hold Airwolf logo artwork -- within the digital domain -- as good as this. I've also been in contact with AIRWOLF's original graphic designer, Andrew Probert during 1998 to, as his pioneering graphics and design work on the show actually influenced my career choice from the very beginning. It's great how AIRWOLF (the show) has been a catalyst for so many other things in my life (and others)... although I don't actually get time to watch the show much any more. I wanted to give everyone ultimate value-for-money with a total of 22 tracks on the main CD1... the real problem was with lack of physical space on CDs... fans got nearly the FULL 74 CD-capacity minutes for their money + the Bonus of Levay's NEW extended arrangements of the 1st Season themes. Some tracks were 5~6 minutes long - such as 'The American Dream' and 'Short Walk To Freedom'. I had to pull about 6 tracks just to get the others on the main CD1. 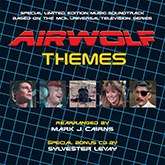 The whole philosophy of the project from the very start was to develop a soundtrack score that "I" would want to buy... being (probably) one of the biggest AIRWOLF fans [some have said "SuperFan"] in the world today. If a track hadn't been up to standard, it didn't go on -- simple as that! I'm a great believer that everyone has "at least one novel in them". Well, my heart and soul (and a personal fortune) has gone into making this project a reality after nearly four years of hard work to get to this stage ... AIRWOLF THEMES is my contribution to that train of thought!